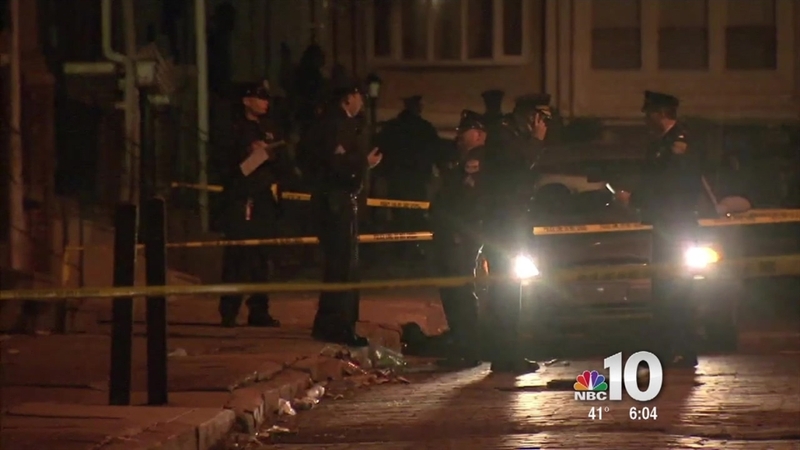 Two men are in custody after a gunman shot up a police car in Philadelphia's Frankford neighborhood. On Friday at 7 p.m., a 15th District police officer was driving in his unmarked vehicle east on Bridge Street. Two men who were apprehended during a narcotics arrest were also in the back of his vehicle. As he was driving the officer suddenly heard gunshots and turned north on Lesher Street where he saw several people running. The officer reported the gunshots on police radio and turned right onto Hedge Street. As he continued south he saw a gunman approach his vehicle from his right and open fire, striking his police car twice. As many as 12 shots may have been fired, based on witness accounts and evidence markers on the ground. "Just a whole bunch of gunfire," said Ruby Johnson. "It sounded crazy." The officer took cover and stopped his car. He then chased after the suspect on foot as he ran into a side alley that led west back toward Lesher Street. After running through the alley with his gun out the officer was met by three men with their guns pointed in his direction, investigators said. The officer took cover and identified himself, according to officials. Two of the suspects, one armed with a silver revolver, ran north on Lesher toward Brill Street while a third suspect, who also had a gun, ran south toward Bridge Street but was cut off by responding officers, police said. The third suspect, later identified as 21-year-old Malik Smith, ran back and forth between a parked mini-van before he was finally apprehended, according to police. The officer said he thought he heard the sound of Smith throwing a gun on the ground however no weapon was found in the area. Smith was arrested and charged with aggravated assault, simple assault, and other related offenses. While police say Smith was one of the men who pointed a gun at the officer, they have not yet revealed whether he was also the person who shot at the police car. Another suspect, identified as 22-year-old Genex Johnson, was arrested on narcotics charges but was later cleared of any charges related to the shooting. Two other men were also stopped by police but cleared of any charges in relation to the shooting. No officers were injured during the incident. The investigation is ongoing.